Two-year-old Thayi loves the aerosol therapy room at Senegal’s Albert Royer Children’s Hospital, where she gets to fall asleep on her mother’s lap, breathing deeply – something that is usually hard to do. The mask over her face pumps out medicine that soothes her asthmatic lungs, a condition worsened by air pollution. 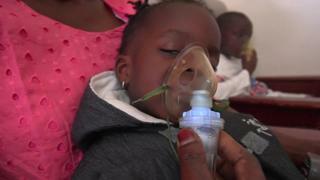 The hospital in the capital, Dakar, has a large unit dedicated to respiratory issues. Dr Idrissa Ba, who has been working there for 15 years, says the number of patients keeps growing and growing – something he thinks is linked to worsening air quality in the city. Dakar does have particularly bad levels of outdoor pollutants or tiny particles, known as particulate matter (PM), which is how pollution is measured. Air pollution: What is particulate matter (PM)? These particles can reach deep into the body with the danger of causing lasting damage to people’s health. According to the World Health Organization (WHO), a safe level of PM10 should be 20 and the level of PM 2.5 should be 10. In Dakar, the average levels are 146 for PM10 – seven times more than recommended – and 30 for PM2.5. This is according to Senegal’s centre for air quality control, whose director, Aminata Mbow Diokhané, says it is important to understand that most cities do not respect the recommendations. She adds that Dakar is one of the only cities in Africa to measure air quality daily. Others on the continent are likely to have far worse levels, she says. Natural pollution. Every year during the dry season, an unpleasant wind, known as the harmattan, blows in dust from the Sahara. Pollution from industry and cars. With a growing population, the number of cars and buses on the roads keep increasing in Dakar. And while there are more cars in London or Tokyo, those in Dakar cause more damage to the environment as many of them are old or second hand, meaning they pollute more. More significantly, fuel imported to Africa contains much higher levels of sulphur than that used in Europe or the United States, as an investigation in 2016 by Swiss campaign group Public Eye revealed. This means cars using “dirty fuel” emit more toxic gas considered a major pollutant. “Today the diesel standards in Senegal are still at 5,000 parts per million as compared to Europe at 10 parts per million,” Jane Akumu, a spokeswoman for the UN Environment’s Air Quality and Mobility Unit told the BBC. Anyone who walks around Dakar or drives with their windows open is more often than not submerged by clouds of thick black smoke coming from surrounding exhaust pipes. “The good news is that in December 2018, technical experts from the region met in Abidjan [in Ivory Coast] and agreed to harmonise low sulphur fuel standards in a number of West African countries,” Ms Akumu said. This still needs to be approved by heads of state, but experts hope that by the end of the year all fuel imports to the region, including to Senegal, will have lower sulphur levels. For Dr Ba this can only be good news. “We’ve done studies on the impact of pollution on children’s health and we concluded there is a very significant correlation between the level of small particles and the number of patients having asthma attacks,” he says. But he believes more rules needs to be brought in to regulate vehicles and says it is also about changing attitudes. “Pollution is a problem that affects everyone so the response must be global, but people should also be more responsible, pollute less,” he says. The WHO estimates that around seven million people die every year from exposure to fine particles that penetrate deep into the lungs and cardiovascular system, causing diseases including stroke, heart disease and lung cancer. Children are particularly affected because they breathe more air than adults, in proportion to their size, and their organs are not fully developed. The average age of patients at Albert Royer Hospital is five. One of those who has been diagnosed with pneumonia, a lung infection, is a 20-month old baby boy. Dr Ba agrees that early treatment is key.